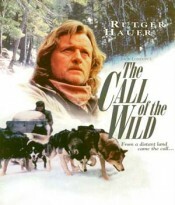 The Call of the Wild: aka "The Call of the Wild: Dog of the Yukon" or "Jack London's The Call of the Wild "
A kidnapped California dog pulls a sled in the Yukon gold rush. Writer(s) - Graham Ludlow; based on a novel by Jack London. Synopsis - This family adventure is the odyssey of Buck, a California dog kidnapped to pull a sled in the Yukon gold rush, as he learns the "rule of tooth and claw." This is the first true adaptation of the classic novel by Jack London, and it is narrated by Richard Dreyfuss. Screened at the Palm Springs International Film Festival. Frederic and Mary Ann Brussat, Spirituality and Practice: "This rugged and unsentimental portrait of a dog's life displays a reverence for the otherness of animals. Peter Svatek directs this harsh drama about the survival of the fittest, which accurately reflects Jack London's world view." As of March 8, 2007, more than 77% of the 170 people who evaluated it at the Internet Movie Database gave it positive ratings, and all demographic groups rated it highly (5.7 or better out of 10). The groups liking it most were women 45 and older (giving it 9.5 out of 10), people 17 and younger (7.4) and women 30-44 (7.3). Directed by Peter Svatek (Witchboard III: The Possession, Sci-fighters, The Rendering; won Oulu International Children's Festival "Starboy Award" for Blue Rider's Silver Wolf and was nominated for Fansporto Best International Fantasy Film Award for Bleeders). Writer is Graham Ludlow (producer of Condemned, In God's Country and Anya's Bell). Based on a novel by Jack London. Stars Rutger Hauer (Sin City, Batman Begins, Soldier of Orange, Confessions of a Dangerous Mind, Blind Fury, Ladyhawke; and seven major awards and three nominations for films including Blade Runner and Escape from Sobibor) and Richard Dreyfuss (Stand By Me, The Graduate, The American President, Stakeout, Tin Men, Whose Life is it Anyway; Oscar for The Goodbye Girl, and Oscar nom for Mr. Holland's Opus; nine awards and nine nominations for films including Close Encounters of the Third Kind, Jaws, Nuts, American Grafitti and The Day Reagan Was Shot). Executive producers: John Buchanan (Bleeders, Asylum, The Thief Lord, To Walk With Lions); Jeff Geoffray (Around the World in 80 Days, Cord, The Hollywood Sign and 24 other films and TV projects); Gary Howsam (Crime Spree, Ripper, The Shadow Dancer, Kevin of the North)and Walter Josten (O Jerusalem, Wake of Death, Shergar; Emmy for The Incredible Mrs. Ritchie; 29 other films and TV projects). Producers are Julie Allan (Treasure Island, Out of Control, To Walk With Lions, Night of the Demons III) and Pieter Kroonenburg (To Walk With Lions, My 5 Wives, Dracula Live From Transylvania). Special effects supervised by Louis Craig (Lucky Number Sleven, Catch Me If You Can, The Day After Tomorrow, The Terminal and The Bone Collector;BAFTA nomination for The Fly). Original Music by Alan Reeves (Owd Bob, Bethune: The Making of a Hero; Genie Award for Best Original Score for To Walk With Lions). Cinematography by Sylvain Brault (2001: A Space Travesty, Federal Protection; Emmy nom for Nouvelle exp�rience, Genie Award noms for Rowing Through and Mon amie Max). Film Editing by Denis Papillon (The Old Man and the Sea, Varian's War, Witchboard III: The Possession; won American Cinema Editors Eddie award for Hiroshima; nominated for other awards for that film, The Baroness and the Pig and Louis 19, le Roi des Ondes). Production Design and Art Direction by Michael Devine (Where the Red Fern Grows, Screamers and Sci-fighters). Costume Design by Claire Nadon (Satan's School for Girls, Big Wolf on Campus). Broadcast in the U.S. on The Family Channel on June 22, 1997 it earned recognition from audiences and critics alike for remaining true to the classic tale. Released on Russian DVD in 2001.